I’m not sure how to attest for this missing period of time on our blog…so I’m just going to fill it in as best I can. We finished our Short, Short Trailer trip and returned home in mid November. We had nothing to do, except unpack and relax around the house. If you know us…you’re already laughing uncontrollably. We returned on November 13th and headed back out the door on November 18th, to meet up with our Florida kids and grand-kids, at Collier-Seminole State Park in Naples Florida. This was a very nice, small park. Great for the kids to ride around on their bikes. We had campfires every night and ate our way through a few bags of marshmallows in the evenings and pancakes in the morning. It’s hard to get a good picture off this gang! No wonder these people are a bunch of cut-ups! Apples and trees, they don’t fall very far. 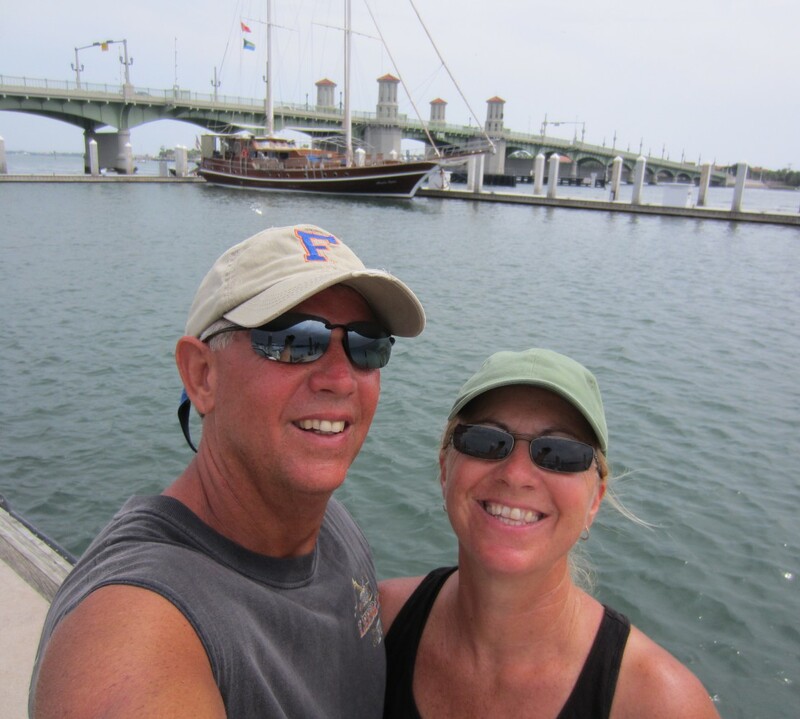 We had a great few hours hanging out with Tommy and Alecia, as they headed South through Jensen Beach on Saol Nua. It’s amazing how many great friends we have made along this adventure! We had a big crowd for Thanksgiving! Josiah and Sami came from Dallas to be with us, it was a great day to be thankful for family and friends. Every year close to Thanksgiving, its gonna be Josiah’s birthday. This year we celebrated a day early, while the whole gang was here. Julie made a delicious cake, and Josiah’s still able to blow out all the candles, whoohoo! Josiah’s 27th birthday…no helping with the candles, kids! We always make time to go for a ride! We have been blessed with so many friends since we began this adventure. Jack and Cheryl, from Zig Zag, came to visit! Yes…I promise Cheryl was there, too…she always manages to elude my camera!!! Eureka and Nyah had a good ole reunion, Pepe was being a cat. While Josiah was in the area, we were able to spend a few more days with him up at our place in the Ocala Forest. Here’s a change up…dinner by Josiah, photography by Mom! On December 5th we headed out to Indiantown to the DuPuis Wildlife Management Area. This is a free campground, although you need to go on-line and register in advance. There are no hook-ups for water or electric (we brought a generator.) They do have a dump station on site. And speaking of sites, there were no designated spots, just pull into an area and put out the table cloth. But, that also means, that after you are all set up, someone can set up too close, which is what happened to us. It was nice this time of year, no bugs, and we didn’t need any a/c. My brother, his wife and my sister came to town, and we celebrated an early birthday dinner for my Mom. Mmmm, Captain Jack’s buried treasure. I miss Ale House! Can Mom have another birthday soon? Early Birthday dinner for Jennifer’s Mom. Austin and Kiera invited us to their school parties. We are relaxing, right? We really need to make sure our new camper is working, so, on December 18th, we headed out to the St. Lucie Locks campground, and though it was close to home, we had a great time. We had a few visitors, a couple of hikes, a couple of bicycle rides, and a great time just watching the boats go through the locks. Russ had the whole place lit up with a ton of Christmas lights, too. This was a great campground, difficult to get a reservation, because there are only ten or so sites. We will come again. Before we knew it, it was time for Christmas festivities to begin. Kiera and Chloe, twirled their way through the Stuart Christmas Parade. Christmas in our world is always spread out over a week or two. First up, another visit from Josiah! I think he just came to see Nyah and Pepe, lol! Josiah and Nyah. Nyah loved her lion mane, and proudly pranced around. Christmas Eve and Christmas day with the family. When Missy comes to visit, that means presents from Miss Nancy for everyone! Russ’ high school buddy, Dan and Pam, came to hang out after Christmas with us. And just in case you think we couldn’t possibly squeeze any more into the schedule, all my cousins came to Jacksonville, and I had not seen them in many years. So I ran up to visit my Aunt and Uncle, and all the cousins! I was home by New Years Eve! Hanging out with my cousins! And that was a wrap on 2016! Do you think we squeezed enough in? It was a great year, and we would do it all again. This adventure is absolutely awesome! Welcome 2017. What can we find to do this year? Let’s start with a camping trip to Gainseville and Chiefland, Florida. We spent January 4-8 at Paynes Prairie Preserve State Park, just South of Gainesville. It was a great campground, filled with beautiful oak hammocks, and a short walk to Lake Walburg. Unfortunately, the weather didn’t cooperate with us. A cold-front moved in, we had rain and a too cold for South-Florida people kinda days. But, we didn’t have a wet tent to deal with!!! We moved on January 8th to Manatee Springs State Park. The weather cleared up and we had a fabulous time hiking, kayaking, and eating some really great BBQ at Anderson’s Outfitters located right in the park on the spring. Russ trying out his Christmas gift from Josiah and Sami. Hiking trails abound. Manatee Springs State Park. We had a great dinner with Ashton and Nina, on s/v Soul Mate, while they were held up waiting for a weather window to head out for the Bahamas. Have I mentioned how much fun we have been having with all these boating people we have made friends with. Wish we could have gone to the Bahamas with you! Ashton and Nina, just one pic with the peacock! And our sad day, the one we were dreading, where Nyah walked over the rainbow bridge to the special place that our fur-babies go. She was the best pup ever and our hearts are broken! Miss you girl, you are the best! We tried to stay home…but… So we spent a few days at our place in the Ocala National forest. More hiking and fires and a few more tears! Our place in the Forest, is just a nice ride to St. Augustine…and no trip to St. Augustine would be complete without O’Steen’s and visiting friends who happen to be in town. We found Mike and Lori working. What’s wrong with these people! It was great to make them stop and have a drink and catch up since we last saw them back at Boot Key Harbor. And just when we think we can take a break…the bottom needs a little attention. We headed out to the inlet with Ike and John, to give the boats a little TLC. Hey look! We still have a boat. Now that the sailboat bottom is all cleaned up, we decided to…wait for it…take a camping trip to the Keys! Fun, fun, fun hanging out and catching up with everyone, and the weather was perfect! We had to move two times during our stay to make it work, but it was worth it! Scrapple for breakfast at the Wooden Spoon. Oh, yea…he don’t like scrapple, he got pancakes! Crane Point and Russ’ birthday with Steve and Cyndi…and Molly too. Burdidne’s for dinner and Music of Cory and Ty. Roland and Lita, Tommy and Alecia and gang, and Steve and Cyndi. Pepe misses being on the boat! We slowed down for March. We have another adventure for April and May, so we need to pack and get it all together. But not until we celebrated my Dad’s birthday with a weekend trip to the Ocala National Forest, with my sister and her girl, Roxie! Around the house while we were packing, our bird of paradise bloomed and Missy came to visit for a few days. We did a looong day up to Daytona Bike Week…I think there’s a reason they call it a bike week and not a bike day! It’s a lot to squeeze into one day, but we did it! It was much easier with the Krispy Creme donuts on the ride home, Thanks Jennifer for the great snack idea!!! A Couple of family birthday dinners, and we are ready to gas up the truck and head out of here. Hey, thanks for hanging in there for my catch-up blog. You know we love you and are glad you can follow along with our crazy adventures! Stay tuned…more to come! Great catch up post. Waiting for more. Thanks Ken! You need to come down and visit, so we have more things to post! We’re hanging out in Marathon for a bit.